Here at Scyphus, we understand the many problems associated with petroleum-based plastics. We strongly believe that compostable bioplastics are the solution to most of these problems. Many people, yet, are overwhelmed with a massive amount of promotional information, still feeling confused about the exact properties and differences between Polylactic Acid (PLA), Polyethylene (PE) and EarthCoating. We have simplified them for you. PLA is derived from renewable resources such as vegetable starch, corn, sugarcane, wood fibres and lactic acid. This bioplastic is used for an array of different purposes including the manufacturing of biodegradable and compostable paper cups, deli and takeout containers or fresh produce packaging. 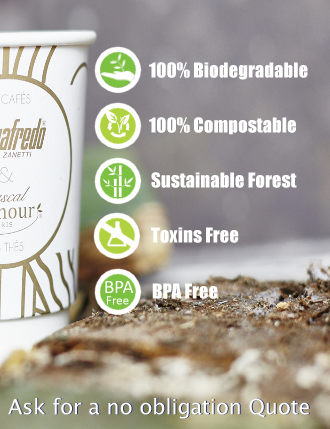 PLA breaks down into natural organic elements once disposed of and compostable paper cups, for instance, turn into natural fertilizers providing the soil with nutrients instead of turning into waste when breaking down. Even if PLA is incinerated, it does not produce any toxic fumes and is safe for people suffering from allergies. PE is a petroleum-based coating used to manufacture certain types of paper cups. It is very hard and complicated to recycle these cups or containers made of PE as the main problem lies in separating the plastic from the paper. This process is cumbersome and requires adapted recycling facilities. All the same, obtaining a 100% separation is not possible. As a result, most of PE cups end up piling up in landfills. Despite having a maximum lifespan of around 30 minutes (reflecting the time for drinking a coffee or tea), a PE cup can stay for thousands of years in landfills biodegrading at a very slow rate. At the same time, since PE is derived from fossil resources, its use is also drastically reducing their finite amount throughout the world. Apart from polluting the environment and causing irreversible harm to the wildlife, PE is also known to trigger human health hazards by because of its endocrine disruptors. By mimicking the actions of the oestrogen hormone, they can cause various complications such as infertility and tumours. A new material being currently promoted as an alternative to 100% plastic coatings for paper bases packaging, EarthCoating does consist of a minimum of 40% plastic. This mineralized resin engineered for providing superior barrier and heat seal needs to be processed through adapted paper recycling equipment. As a result, despite being branded as an environment-friendly material, the reality is that it cannot biodegrade into natural organic elements like PLA.